This is called 'Namprik Thai Tae' which means Real Thai Namprik. Loaded with flavor: a combination of salty and spicy, from dried shrimp and crushed chilli peppers. You could not ask for a better company than Mae Pranom to make this one. They are so focused on making real, authentic Thai food using the finest ingredients. The package says in Thai language it's 'perfect for traveling with to outside of Thailand'. Perhaps no four ingredients represent real Thai flavor as much as these, mixed to perfection by Mae Pranom. There is a wide range of uses, simply add it to anything you might be cooking (soup, stir-fry, marinade, dipping sauce, etc). 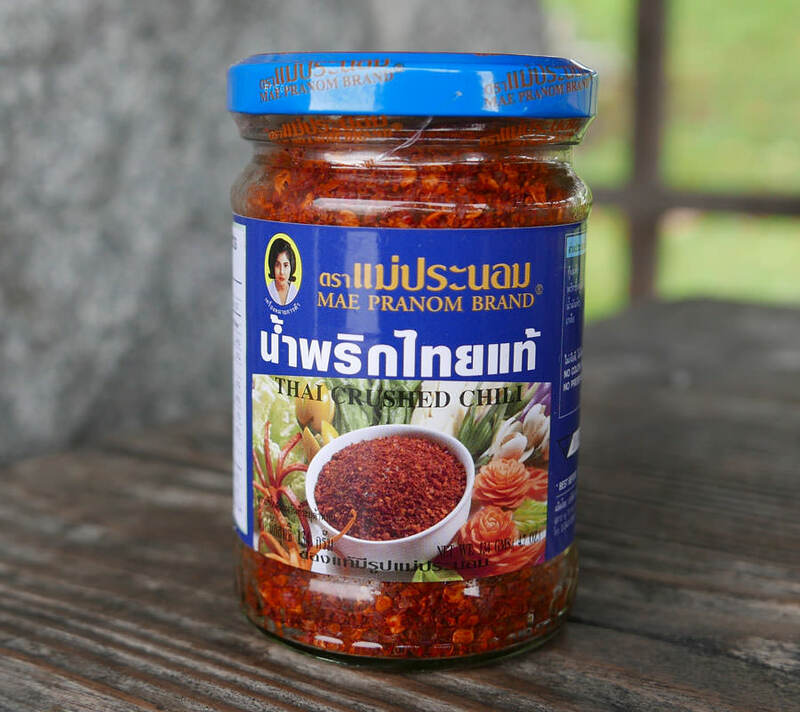 We love this as shown in picture below: mix a spoonful of Mae Pranom crushed chili with equal parts of fresh-squeezed lime juice and fish sauce. Then spoon this mix over steamed jasmine rice. This nice sauce can also be served as a dipping for grilled meat and sticky rice. We once ate at a very popular Thai restaurant that seemed to be known entirely for their meat dipping sauce, which was simply this mixed with fish sauce and lime juice. Pricey due to 40% dried shrimp. Packed in a nice large glass jar, and one jar of this goes a long way. Ingredients: dried shrimp 40%, dried chilli 40%, vegetable oil 15%, salt 5%. Product of Thailand.